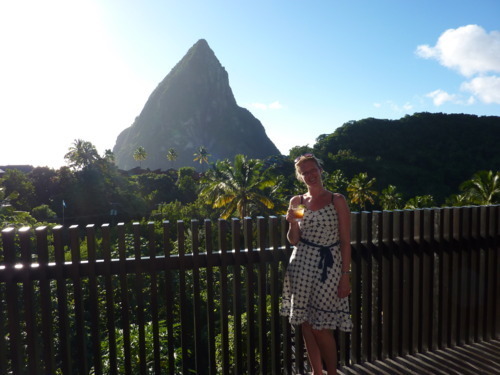 Self-confessed chocoholic, Lizzie Bray, from our Oceans & Islands team recently returned from a tour of the Caribbean, where she had one of the most indulgent foodie experiences of her life at the Hotel Chocolat. Here’s her account of what she calls ‘The Plantation of Pure Paradise’. From the moment that I heard that my favorite brand Hotel Chocolat were building an actual hotel in their actual chocolate plantation, I knew I just had to visit. Now usually I would say I am a foodie, as I have been very lucky to work in some lovely hotels in my past with well known chefs. And lets face it, as many ladies are, I am also a chocoholic too. 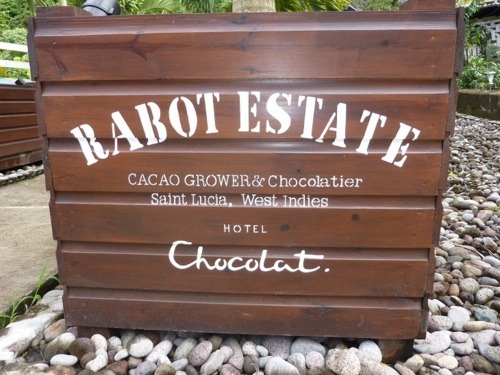 As we walked past beautiful chocolate colored boxes with the Rabot Estate and the Hotel Chocolate logo, shudders of sheer excitement ran down my spine! 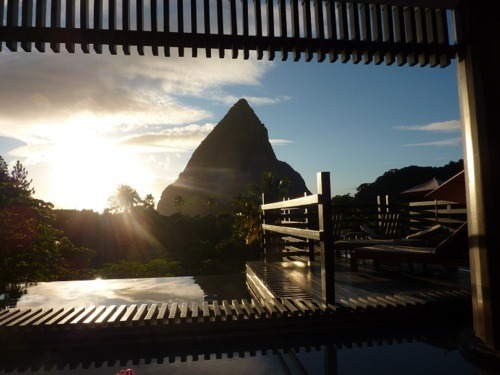 We were greeted by friendly staff who showed us into the main seating area of the restaurant, where the view of the St Lucia’s famous Pitons took our breath away. The only other mountain I can compare it to is the beautiful Matterhorn in Zermatt, but the summer version. It was mesmerizing, and I could only grin as we sat filling in our registration form, whilst sipping different cocktails. One was made from chocolate and the other was a Champagne Cocktail with the lychee type flavor of the chocolate pod before it starts the process of being turned into cocoa. We were then taken to our room, which are named the Chocolate Pods! 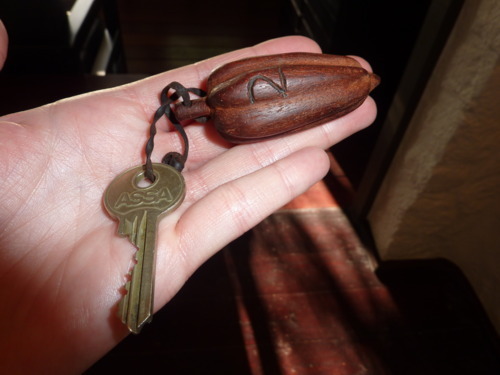 Even the wooden key rings are carved into a pod shape. They have made the pods so special and thought of everything. As you walk through your room you notice an outdoor shower where you stand on pebbled flooring with wooden slat ceiling, a beautifully modern bathroom with well know Ren amenities, and a romantic four poster bed with mosquito nets. 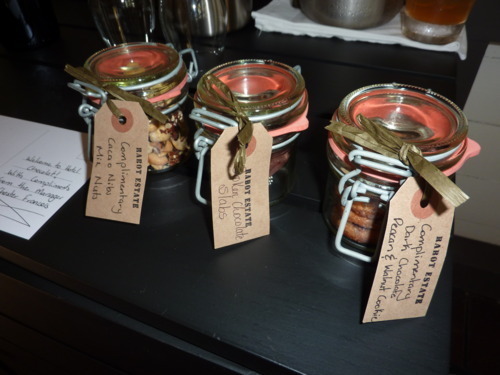 You are greeted with three lovely little snap shut glass containers with cocoa nibs and nuts, broken chocolate slabs and dark chocolate pecan & walnut cookies. This is just the start of the chocolate paradise! There is a lovely infinity pool, which is superb to sit, lie and swim in and take in the breathtaking Piton views before supper. 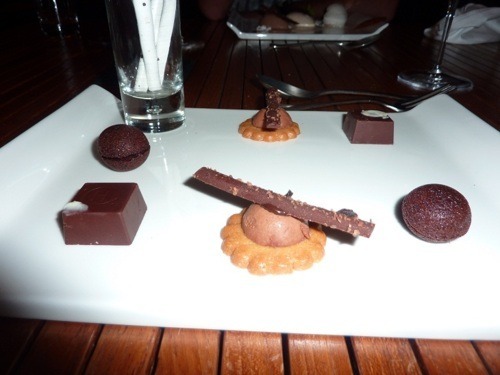 We were also lucky enough to try the Tasting Menu at Hotel Chocolate, which was superb. 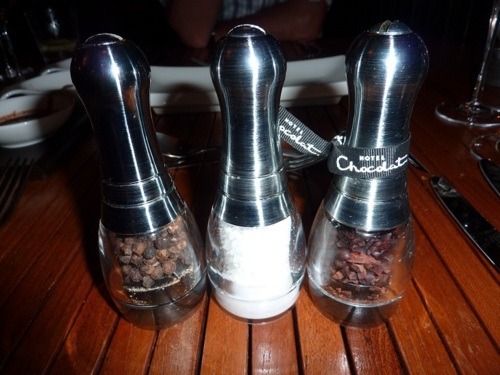 As you sit at your table you notice that as well as a salt and pepper shaker, there’s also a chocolate shaker, should you like to add a little bit more chocolate to your dish. 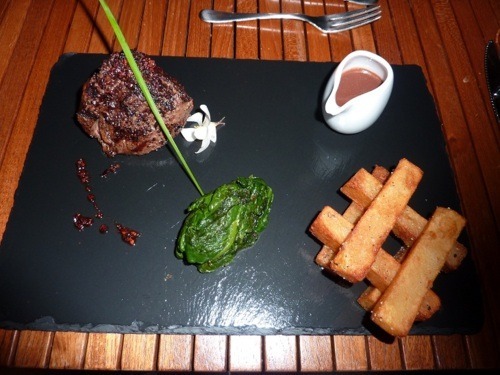 We were then brought a dipping plate of lightly toasted bread with tiny chocolate chips dotted throughout, olive oil, balsamic liquid chocolate and butter with chocolate nibs. 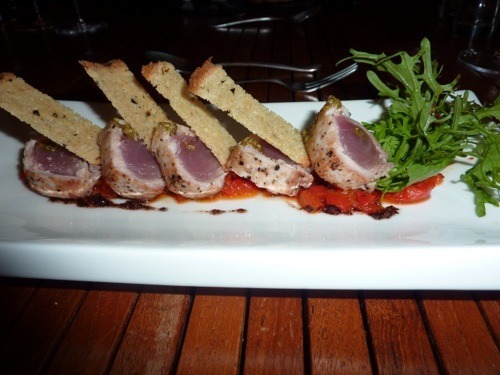 Next followed six courses of chicken, seared tuna, steak or fish, all with chocolate or the pod in its different stages carefully incorporated into each dish making it exquisite. Then followed an amazing dessert – chocolate, of course. I totally recommend the tasting menu to guests. You may ask yourself how a menu could have chocolate in everything, even savory dishes, but I can assure you, it just works. It is tried and tested! 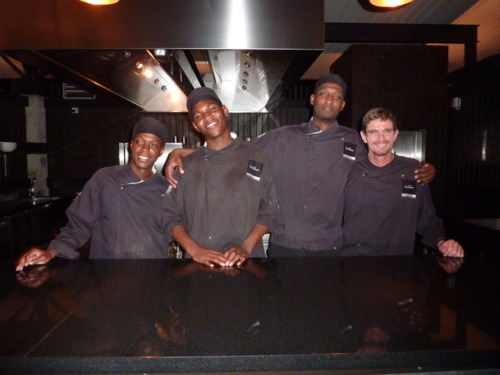 After dinner I popped in to speak to the chefs in their an open plan kitchen and you can see the culinary delights being made in front of you. Breakfast was indeed another piece of heaven, and I really recommend even non residents pop by for the breakfast experience. Try the chocolate and hazelnut spread they happen to pop on your table as an extra – divine. During the week, the hotel runs a ‘Bean to Bar’ experience which can be booked in advance where guest can make their own chocolate bar. 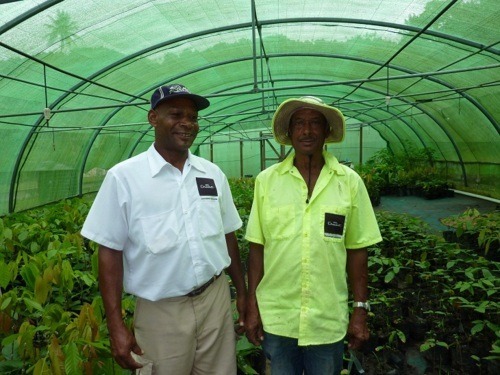 Another highlight was the plantation tour, where the gardeners who have been there for years talk you through the process of chocolate farming. The detail how the pods grow, showing the different array of colors they turn, and how they harvest them with special hand held knives/axe cutters on the end of a wooden stick which allow the fruit to regrow and not damage the tree. Who would have ever thought so much goes into the smooth velvety substance called chocolate! If you are lucky, they may let you do a spot of grafting. This is where you cross breed a mother plant and a new baby plant to make different types of chocolate, cutting the stem and grafting it together with cellophane, to keep the moisture in and produce a new plant as they grow together, but keeping the mother plant flavor and the well known Hotel Chocolat that we all know and love. 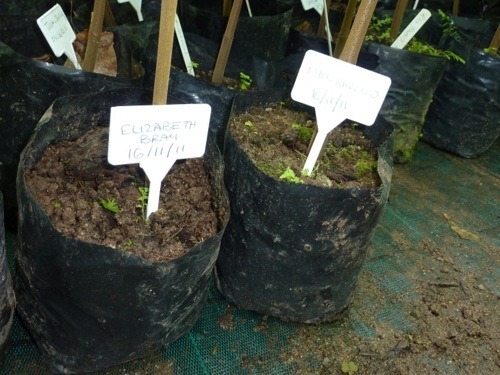 Once you have grafted your plant, you label your little tree, place it in the green house, and they plant and grow it in the plantation for you once it has grown together. It takes two years to grow, so if you happen to be back then the hotel will show you where your tree is planted. 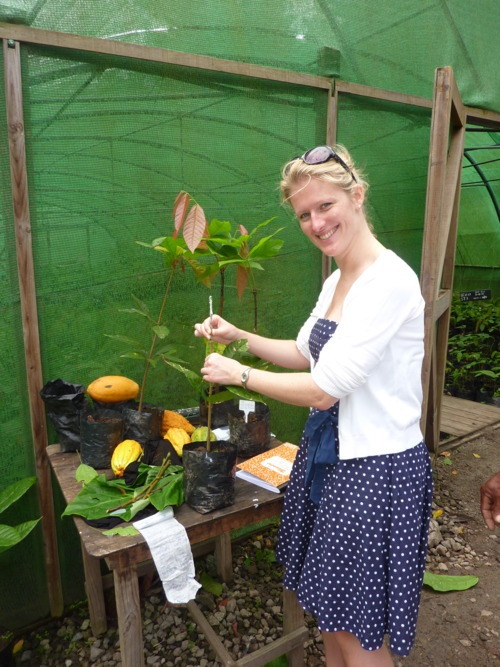 This gives you another reason to visit the beautiful island of St Lucia again, to see your tree! 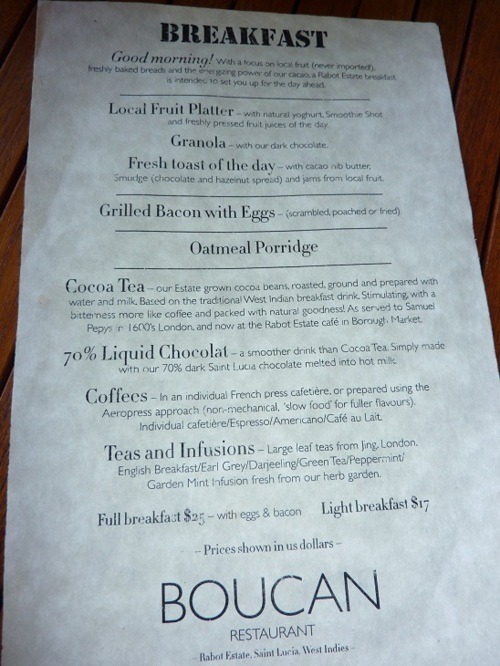 I think if anyone is lucky enough to visit the island of St Lucia and you enjoy chocolate, I recommend you pop in for 2 or 3 days, or even just visit for breakfast or dinner if you are close by.